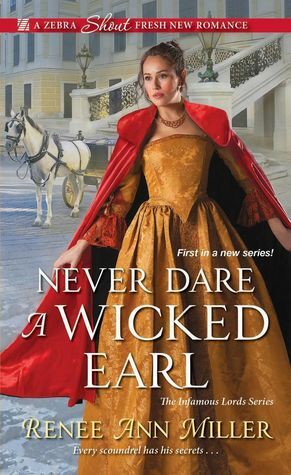 From Goodreads.com: Known as a brazen philanderer, Hayden Milton, Earl of Westfield, is almost done in by a vengeful mistress who aims a gun at a rather essential part of his anatomy—but ends up wounding his thigh instead. Recuperating in his London town house, Hayden is confronted by his new medical attendant. Sophia Camden intrigues him, for behind her starched uniform is an enticing beauty better suited for bedding than dispensing salves and changing bandages. Unshaken by his arrogance, not to mention impropriety, Sophia offers Hayden a dare: allow her ten days to prove her competency. If she resigns in exasperation like her two predecessors, she will be beholden to this wicked seducer. As a battle of wills begins, Sophia finds herself distracted by the Earl's muscular physique . . . and discovers that the man within longs only for a second chance to love. This is the second story in the span of a week that I have read that deals with the Hero having been shot, and the Heroine having to take care of him. When I first began reading, I was a little distraught. I mean how many novels with the same initial story-line can one read so close together and still be entertained? Thankfully, this one was so much different from the other that I found myself completely drawn in. The author weaved such a compelling story-line that it was hard to put down. I adored both of these characters - Hayden's inner demons coupled with his reputation made him a complex character that I enjoyed watching Sophia peel back the layers of. I also liked that she was a very strong willed character. I do feel this would have been a slightly better story if the Hero didn't fall into the "let me do stupid things that upset the object of my affections in the name of protecting her" story-lines, and the Heroine wasn't equally guilty of the "let me overhear something I shouldn't that makes me doubt everything". While those are two story-lines that while it no doubt work consistently, they do become tiring, and honestly, they make the story become somewhat predicable after that. We know how the Heroine is going to react, we know something bad is going to happen, just like we know the Hero is going to try to save the day. Perhaps that is a sign that I read too many stories like this, but every now and then I would like to see the Hero treat the Heroine like an equal and have them face the threat together. Even considering that, I still believe this story will appeal to those who enjoy slightly unconventional historical romance novels. I would definitely read more from this author! DISCLAIMER: I received a complimentary copy of this novel in exchange for my honest review. This has not affected my review in any way. All thoughts and opinions expressed in this review are 100% my own.